In recent years, we've seen an increase in large, public memorials following highly publicized tragedies, such as mass shootings and terrorist attacks. Alongside the growth of these shrines is a pattern of libraries and archives choosing to collect and curate collections of some of these objects to be housed in grief or trauma archives. Below are some resources for those contemplating such a project, including quick-read handouts, video from two related panels at the National Council on Public History in 2018, and materials for further study, including a book chapter and educational module for LIS students. Documenting Resilience: A panel of archivists and librarians at the National Council on Public History conference 2018. This session aims to provide insight and guidance to historians, archivists and librarians who must develop responses to unanticipated and unthinkable tragedies. Presenters discuss research and experiences with the condolence archives created in the wake of violence at Virginia Tech, the University of California, Santa Barbara, and in Las Vegas, followed by a discussion around essential questions and best practices for those working with condolence artifacts and collections. Exhibiting Sorrow: A panel of archivists and librarians at the National Council on Public History conference 2018. This session aims to provide insight and guidance to historians, archivists, and curators who are developing memorial exhibitions paying tribute to lives lost in massacres and terrorist attacks. Presenters discuss research and experiences with curating exhibitions related to the 9/11 terrorist attack; the Pulse Nightclub shooting in Orlando, Florida; the rampage in Isla Vista, California; the AME Church shooting in Charleston, South Carolina; and the shooting at Sandy Hook Elementary School in Newtown, Connecticut. A quick-read of important questions for coping with a sudden influx of condolence materials. 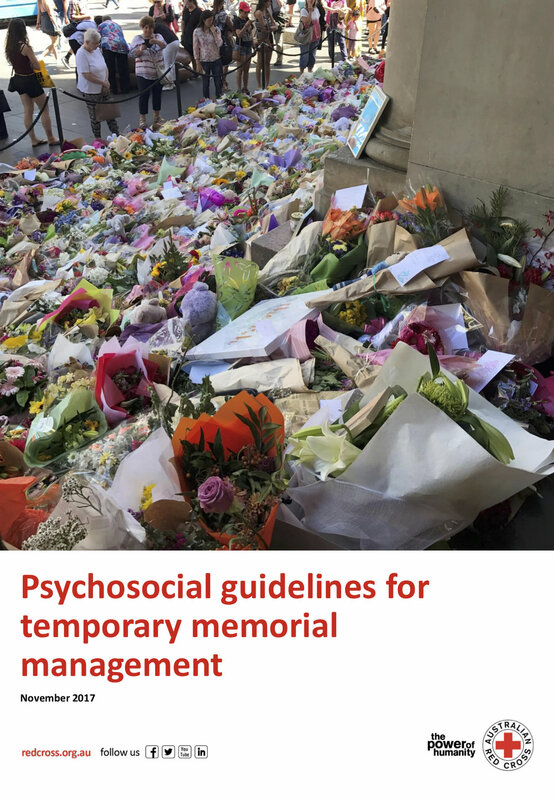 A guide for logistics of managing a temporary memorial, published by the Australian Red Cross. 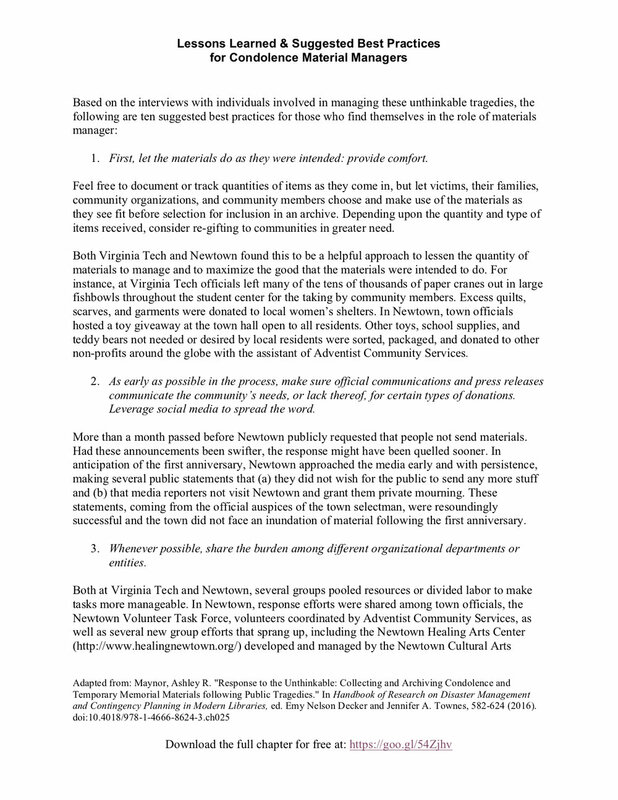 A quick-read of some lessons learned and basic best practices for those who find themselves responding to an unthinkable tragedy. 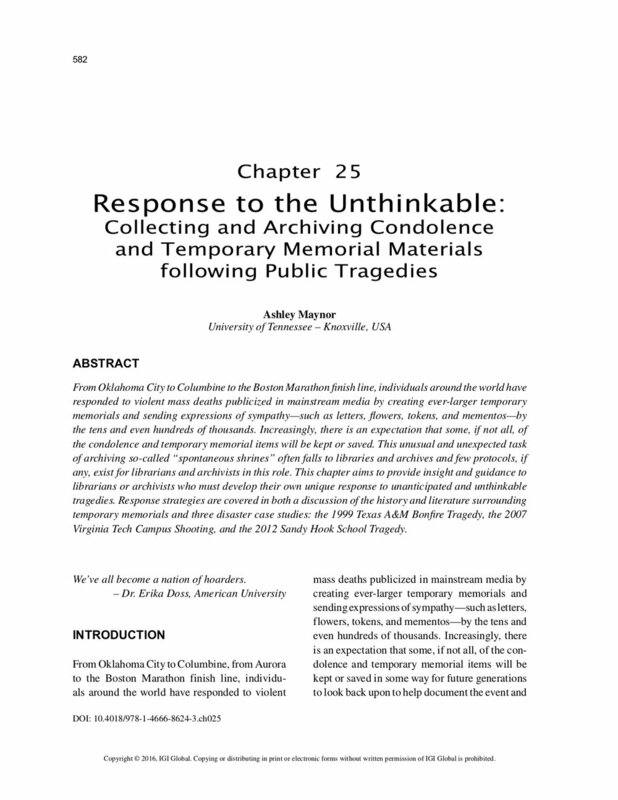 This book chapter contains detailed case studies of three tragedies and the community response, including essential questions and best practices based on these cases and many others. 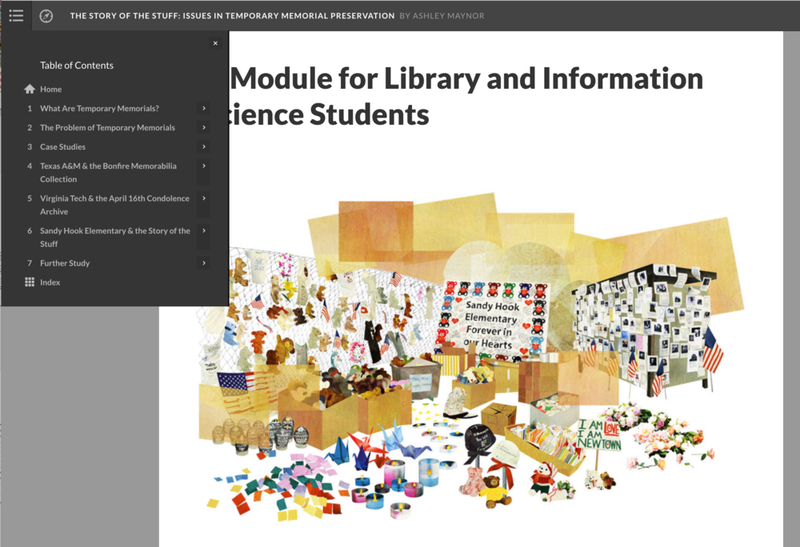 This module is an online, interactive lesson designed for graduate students in Library and Information Sciences. It includes images, video, and exercises to explore the role of libraries and archives in documenting and preserving the materials left at temporary or makeshift memorials. 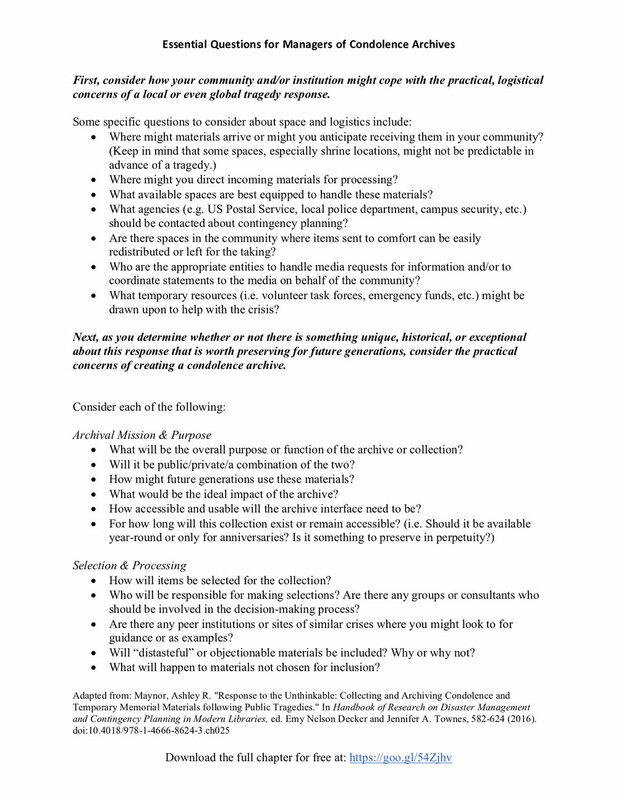 It may used in conjunction with exploration of the The Story of the Stuff web documentary or as a standalone tutorial.